Photo: Scenic Palm Beach, looking South. Situated at the tip of the Northern Beaches, the beach stretches from Barrenjoey Lighthouse in the north to Careel Bay in the south, some 2.3km long. There is a stunning lookout from the lighthouse area. Just on the other side of the peninsula is the calm Pittwater, with fishing, waterskiing, kayaking, sailing, swimming, ferry trips, cruises and scenic flights. You can hire windsurfing equipment and catamarans at Governor Phillip Park. In the park there are barbeque facilities and a kiosk, as well as a golf course. The beach itself is quite long. There is a huge dune near the north end, people go there to go Sandboarding. Barrenjoey Lighthouse is a 20-30 minute walk northwards, along the beach or the parkland, offering grand views of the Hawkesbury River outlet to the ocean, Broken Bay and the Pittwater. Northward, you can see the Central Coast of NSW. Built in 1881, the historic lighthouse, situated on Barrenjoey Head, is surrounded by an Aquatic Reserve while Barrenjoey Head is part of the Ku-Ring-Gai Chase National Park. There are two trails up to the top, the old Smugglers route, which is shorter and steeper, or the very scenic walk from the parking area. The other is the Barrenjoey Lighthouse Walk. Head north from the Palm Beach Car park, located on the west of the peninsula. Certainly one of the most scenic walks to be found in the Sydney region. On exceptionally windy and rainy days, these walks are not advised. Off Barrenjoey Road, how to get there: Wynyard Bus 190. The route follows the long and windy road, with plenty of scenery of other beaches and leafy suburbs along the way. Covering Up - Sydney has bright sunny days so wear sun-protective clothing, especially between 10am to 3pm. Find a good SPF30+ sunscreen that is water resistant. Use shade and wear a hat, it all helps to stay looking young, healthy and beautiful as you do. 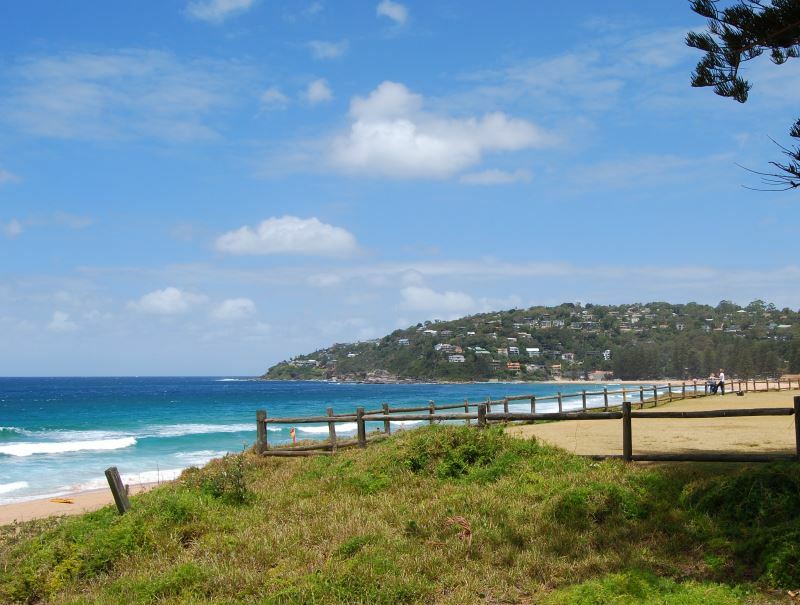 More about Sydney Northern Beaches. Main Photo: Scenic Palm Beach, looking South.